I haven’t yet finished reading all the books I received at Christmas, but I received another stack for my birthday this week. Yay! 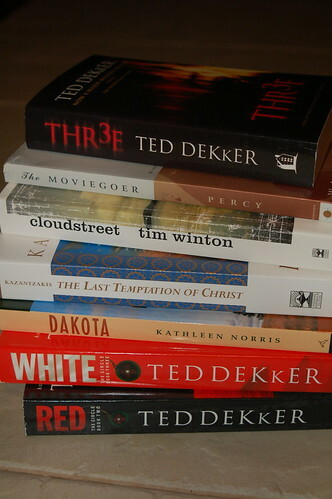 This time the stack is much more fiction-laden, which is a good thing. Unfortunately, I can’t let myself pick one up until I finish the tome I’m currently reading, Chronicles of Wasted Time. See here and here for what I had to say about early pages of the book. Not surprisingly, several of the titles are on the list of 100 books I’m making my way through. Hopefully I’ll get to crack open these titles soon. Yes, it’s quite exciting! 🙂 I’ll be sure to let you know, when I get to it! Seeing this stack, I’m reminded that I never finished/got through Cloudstreet. And that kind of bothers me. All those awards. I’ll probably give it another try, sometime. (When?! How?! So much to read.) I did very much like Winton’s That Eye, The Sky, however, and do certainly want to read more of his work.